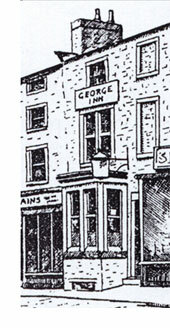 The George Inn was not an Inn in 1822 but listed as an Alehouse in 1872 when its licensee was Margaret Walker. Several Licensees followed, including Herbert Varley, who came from the “Star” in New Market. Circa 1902, John T. Brumfitt was Landlord. There were three more Landlords, the last one being David Reece from 1905 until the expiration of its licence on 23rd December 1908. It was demolished a few years later along with other adjoining property, when a new block of shops was built on the site. The shop stood on its site is now Discount Fashion.